Think this polar vortex was cold? It should have been colder. Now that the latest frigid, deadly Arctic blast is giving way to warmer conditions in America’s Midwest and Northeast, some clarity is emerging on how to think about cold waves in a warming climate. An initial blizzard of headlines gave the impression that this week’s cold, driven by the weakening of the “polar vortex”—miles-high winds circling the North Pole—was a monumental event, and some accounts projected worse to come under global warming. But many climate scientists focused deeply on the response of extreme winter weather in a human-heated climate see a different picture, explaining that data clearly show a long-term trend toward fewer, less widespread and less severe cold snaps of this sort. And the pattern is not limited to the United States. Those background trends are a far more robust signal of human-driven planetary warming than any recent shifts in the behaviour of the vortex. There’s been a predictable pattern around this issue since the winter of 2013-2014, when “polar vortex,” actually a decades-old meteorological term, first became something of a meme as a brutal cold snap and winter storm named Hercules captivated the media. Since then, there’s been a tendency of climate campaigners, commentators, and news-hungry media to zoom in on the handful of pioneering, but tentative, studies finding that such outbreaks of cold air are worsening as a result of climate changes being driving by the atmospheric buildup of human-generated greenhouse gases. The cold wave that swept from the Midwest through the Northeast in recent days set many single-day records in some cities and barreled across the country with jaw-dropping intensity. But it wasn’t remotely close to some truly monstrous cold waves in earlier decades. On Thursday, Bloomberg’s Climate Changed team helped cut through the noise by citing the “cold-wave index” developed over more than 20 years by Kenneth Kunkel, a researcher at North Carolina State University who for three decades has studied extreme weather in the long-term context of climate. The index sifts weather-station data from across the country to estimate the duration and intensity of regional extreme cold spells, going back to 1895. And nothing from the 20thcentury on compares to what was called the Great Arctic Outbreak of February 1899, Kunkel said. "Cloud streets" stream over the Great Lakes in this image from the NOAA-20 satellite. When extremely cold air moves over the unfrozen, relatively warmer lake water, columns of heated air begin to rise off the lake surface. As the rising, warmer air hits the cold air above it, the moisture condenses into cumulus clouds that can produce snow. An array of similar findings can be found in the federal Climate Science Special Report of 2017, part of the latest Congressionally mandated National Climate Assessment. The geographic extent of winter cold spells has shrunk as well. In 2016, the Environmental Protection Agency, as part of a broader set of climate change indicators, published a graph showing the declining percentage of the land area of the contiguous 48 states with unusually cold daily high and low temperatures during the months of December, January, and February. Global data show similar patterns. 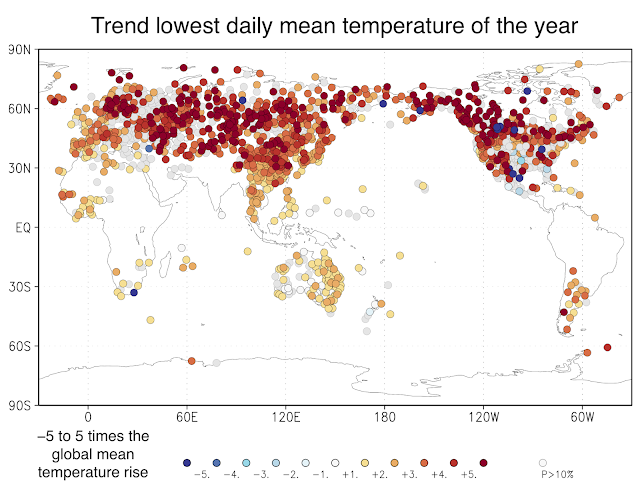 Using the Climate Explorer tool of the Netherlands Meteorological Institute, Cliff Mass, a meteorologist at the University of Washington and popular weather blogger, posted a map this week showing that, worldwide, the annual coldest daily temperatures recorded over the last 50 years have actually risen much faster than the overall pace of global warming. Many stories in recent days highlighted studies concluding that global warming is boosting odds of cold outbreaks—mainly the work of Judah Cohen, a commercial weather analyst specialising in long-term winter forecasts, and Jennifer Francis, a senior scientist at the Woods Hole Research Center in Massachusetts. Independently, they’ve focused on relationships between the shrinking amount of the Arctic Ocean covered in floating sea ice and instances where the polar vortex weakens, allowing cold air to spill south and warm air to flow north. Like all new science on an issue in the public eye, such work tends to get outsize coverage. But that can distract from the reality that all research on a new knowledge frontier is tentative. In this case, a host of other scientists looking at extreme weather in the context of climate change have been far more cautious. In a CBS News web story on the cold and climate change this week, Michael E. Mann, a Pennsylvania State University climatologist who’s become a prominent campaigner for cutting greenhouse gas emissions, stressed the need for caution on this question. But she proposed that the intense public and media focus on winter cold snaps has raised the profile of such questions. A spinning inferno with 230-kilometre-an-hour winds sent scientists scrambling to understand the cause of this deadly phenomenon.